It’s summertime, and the cherries are ripe, so act now! Take yourself to your favorite grocery store, or maybe to the Salt Lake City Farmers’ Market, to buy some fresh, sweet cherries. Sure, you can eat them, or bake them into tarts and pies, but why not use them to make the gift that keeps on giving all year long: cocktail cherries. Yes, you can spend a load of dough (money, not pie dough) on some Luxardo Marasche® gourmet cherries, but why not make your own? It doesn’t take long, and the results just might be lip smacking good. These are great in Manhattans! 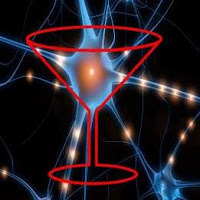 If you want to look at some other recipes, there are several in the World Cocktail Brain. Wash the cherries thoroughly, then cull them, keeping the ripest ones that are unbruised and still have their stems. Pitting the cherries is optional, but be sure to warn your friends if you don’t. If you do, use a cherry pitter, you want your cherries reasonably intact and not cut up. You can follow the recipe below, but if you have several jars, you might want to try some variations in spices or liqueurs. If you do, be sure to mark the jars so you know which recipe you like the most. Note: The finished cherries will occupy less volume than the raw cherries, so if you only want to make a large jar full, one way to measure the cherries is to use about 1 ½ times the capacity of your destination jar(s) in raw cherries. I used a three cup (24 oz) jar for this recipe. If you exceed your jar capacity, keep the leftovers in a covered glass bowl in the fridge until you get a jar (or can gobble them down). Combine the sugar, water, lemon juice, nutmeg and cinnamon stick in a small saucepan. Bring mixture to a boil, stirring to dissolve the sugar, and reduce the heat to medium-low. Add the cherries, bring to a simmer, and simmer for 5 minutes. Remove from heat, allow to cool, and remove the cinnamon stick. Transfer to the jar, making sure to leave room for the Brandy and Amaretto. Take turns adding Brandy and Amaretto in equal quantities until the jar is full. Put the lid on tightly and roll the jar until well mixed. Keep refrigerated.